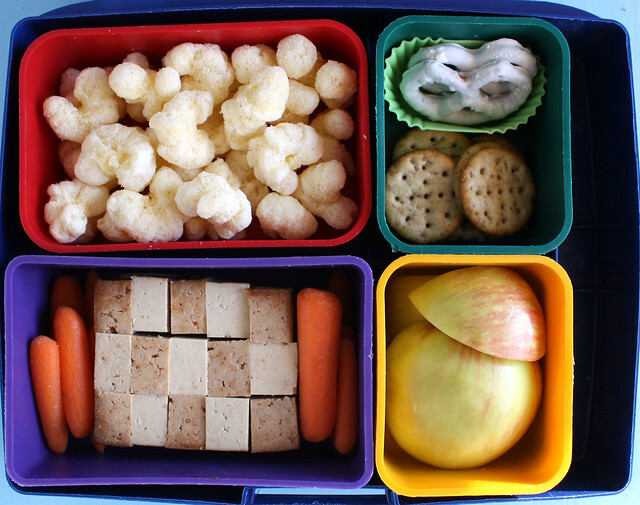 On Monday, I sent Augie off to preschool with a lunch packed in a single layer of our monbento box: carrots, a couple of yogurt pretzels in a small boat-shaped silicone cup (recently purchased at a Daiso store), baked teriyaki tofu cut into strips, cucumber slices and apple chunks. The kids were up earlier than usual because of the switch to standard time, so I had plenty of extra time to make a checkered apple — something I normally find a little too fussy for a run of the mill lunch. About a half hour after I dropped Augie off, the school called to tell me he had stomach flu and that I needed to come back to get him. In all the fuss of picking him up, I forgot to grab his lunch bag, and since he didn’t go back to school until today (Friday) his lunch sat in the fridge most of the week. I was super scared to open it when I brought it home this morning, but it didn’t look bad at all. The carrots were dried out and there was no way anyone would eat it (blech!) but take a look at that apple! 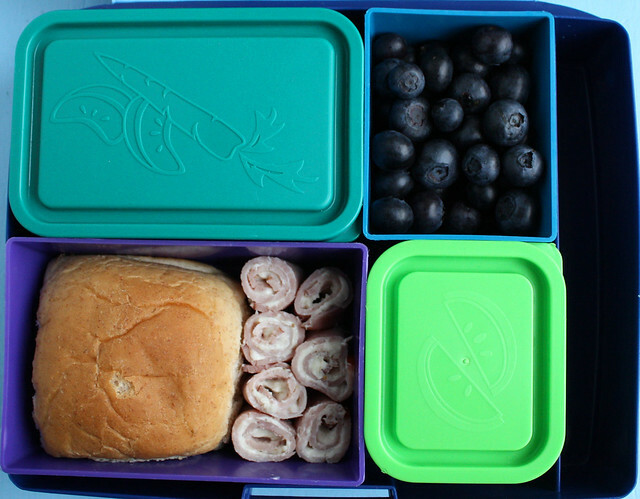 I sprinkled it with Fruit Fresh on Monday and it barely looks different from when I put it in the bento box 4 days ago! I am a total convert to that stuff now. 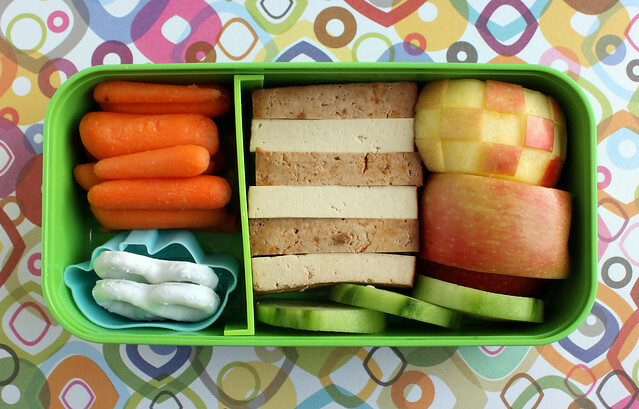 Wyatt had a lunch packed in the Laptop Lunches box: Pirate’s Booty, yogurt pretzels, a few wheat crackers, apple chunks, carrot sticks and checkerboard tofu. 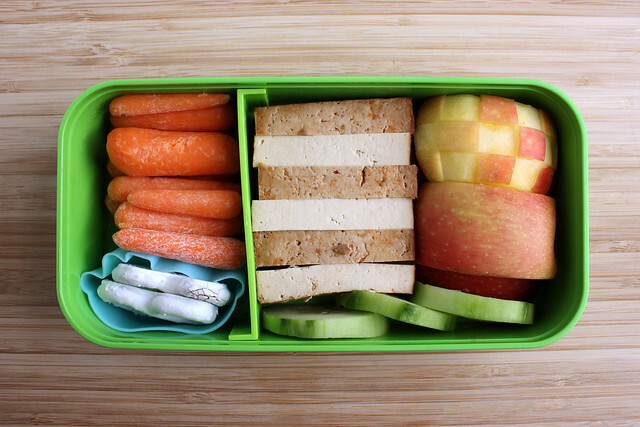 AND…Zach took off on another work trip, so I packed him a bento for the plane, too! 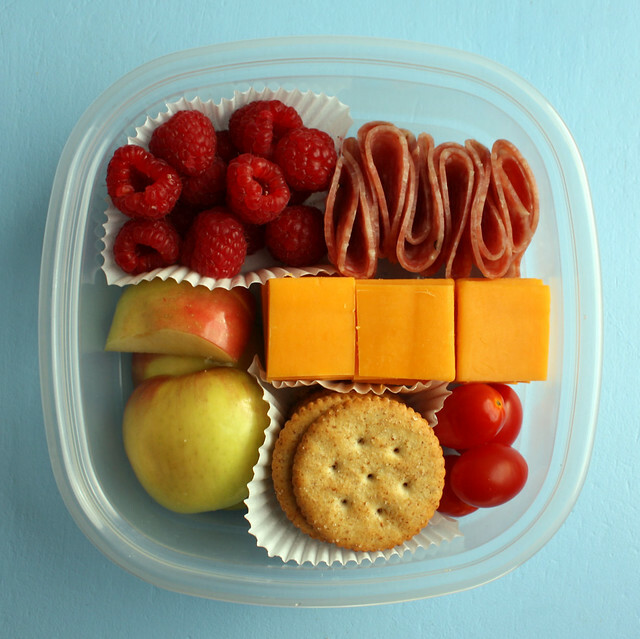 He had raspberries, salami, apple chunks, a bunch of cheddar cheese, crackers and a few cherry tomatoes to fill the last little gap. This was packed in a Glad entree sized food container so he didn’t have to worry about getting the box back home a week later. Tuesday both boys were home from school — Wyatt for parent-teacher conferences and Augie with his stomach bug — so no lunches. 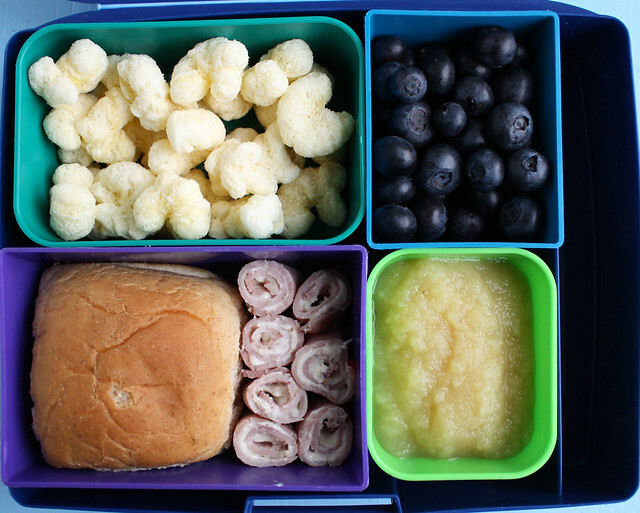 Wednesday, Wyatt’s lunch box held Pirate’s Booty, blueberries, applesauce, ham and cheese roll-ups and a whole wheat dinner roll. The ham roll-ups were something new for us. I spread slices of deli ham with Laughing Cow cheese, rolled them up and sliced them jelly roll style. I also thought I’d share a photo of the box right before I packed it in the lunch bag. I chose a lidded container for the Pirate’s Booty to help keep it from absorbing moisture from the other items in the box and getting soggy. I also put a lid on the apple sauce to keep it from spilling. Augie was on his fourth day of stomach flu on Thursday and I had a raging cold. There was no way I was going to pack Wyatt a lunch, so he ate in the cafeteria at school. Augie was finally back in school today! Hooray! 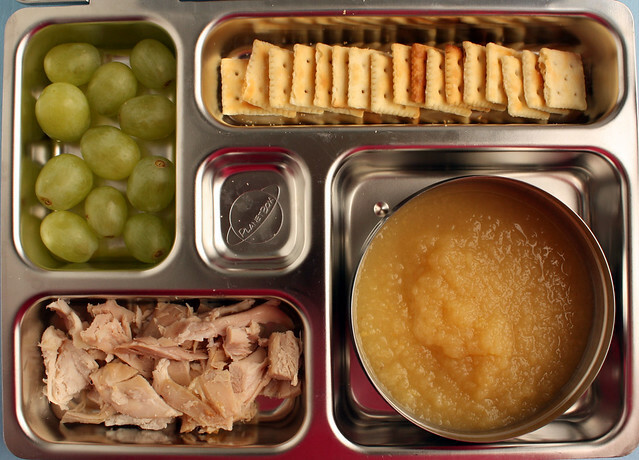 He seems fully recovered, but to play it safe I packed him a very simple, easy to digest lunch: grapes, mini saltines, applesauce and chicken. Per his request, this was packed in our PlanetBox . 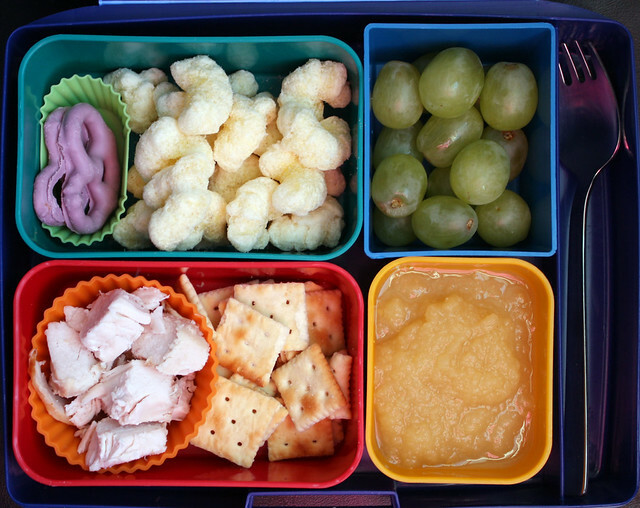 Wyatt’s lunch held yogurt pretzels, Pirate’s Booty, grapes, applesauce, crackers and leftover chicken from dinner. Disclosure: I’m currently being compensated by Glad as a member of the Glad Mom Made panel. I’ll be sharing more tips about using Glad products in the coming months!